The Texas Instruments MSP430 Launchpad is pretty popular in hacks, likely due to its low price. TI has recently released a new C2000 Launchpad device that offers more power and peripherals for $17. 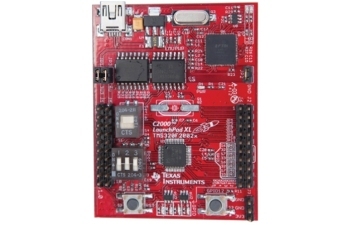 This board uses the C2000 Piccolo processor, which is meant for DSP applications. Also included is an unrestricted version of the Code Composer Studio IDE and the controlSUITE software package. You can also run the free SYS/BIOS RTOS on this board. It’s nice to see TI providing a lot of free, non-crippled tools that could be used to power some pretty advanced hacks. Most MSP430 Launchpad Booster Packs should be compatible with this board, and TI has a new layout for Booster Packs that use the additional pins. There is a C2000 specific LED Booster Pack available now for $30. There are also specifications for building your own Booster Packs for the C2000. TI has released a slightly cheesy promotional video that features a [Billy Mays] like performance. Check it out after the break. Texas Instruments is trying to take the success it had with the LaunchPad and apply it to other chip architectures. The board seen above is their new C2000 Piccolo LaunchPad. It’s a development board for the F28027 chip. This 32-bit offering is a part we know nothing about. A first look shows a clock speed between 40 and 60 MHz, 64k of Flash memory, and a JTAG programming interface. It sounds like an unrestricted copy of Code Composer Studio is also available to use as the development environment. At $17 won’t break the bank, but we also don’t feel that welling of excitement to get in on one of these units. What does get us excited is the Stellaris LaunchPad offering. It’s not available yet (which always makes us want it more), but you can enter a drawing to get a free one when they are released. Be warned, with only 25 up for grabs the odds are against you. There are no details, other than a target price of $4.99 for the ARM development board. We’ve had a lot of fun with the STM32 ARM board, and this might be a new adventure to undertake.